"All the Caustic Carolla you can handle! Not your cup of tea? Move along...."
Having fallen off the reviewing wagon for quite some time, my plan is to start up again on a short and sweet note (i.e. - that's called 'doing it half-assed' in online review speak...). And, as it turns out, I couldn't ask for a better movie for this approach than The Hammer, an Adam Carolla written and starring vehicle from 2007 (and boy does that sound like a damning beginning, but hold on to that thought...). At any rate Carolla plays... himself. For those that don't know, the carpenter-turned-radio personality-turned-television personality actually has some amateur boxing experience (and the story goes that it actually provided a means of entry to the LA airwaves when a radio show host needed someone to train him and Carolla offered his services). So, easily enough, here we meet Carolla as Jerry Ferro, a recently fired carpenter who, in order to make ends meet, teaches a couple of beginner boxing courses that have become so vogue at those high-priced gyms that I see so many be-Spandexed people coming in and out of while I wait online at McDonald's. But the ends haven't met for Jerry in quite some time (and I mean that in every metaphoric and euphemistic way possible), as along with the aforementioned firing, he also gets dumped by his girlfriend. So the now homeless, mate-less, and nearly penniless Ferro moves in with his Nicaraguan sidekick Oswaldo (there's really no better title for the gentleman, who's actually named Oswaldo Castillo, as he literally follows Carolla from scene to scene as a barely understandable ESL set-up man). While the terminally lazy and unfazed Ferro treads water at the gym, he gets an offer to spar a few rounds for $100 with a young up-and-comer who has a fully-functioning in-gym posse and enough ego to go around (played, appropriately enough, by Jeff Lacy, post-Calzaghe loss but, more importantly, pre-Jermaine Taylor bout). And as fate would have it, the southpaw Ferro scores a flash knockdown of the brash youngster and he catches the eye of a well-known amateur boxing coach named Archie Bell (Tom Quinn). With some prodding from Bell, it comes to light that Ferro was a pretty decent Golden Gloves prospect (he was known as The Hammer because of his heavy left hand), but a complete lack of work ethic and the intervening 20 years have robbed Ferro of any boxing aspirations (and, to be honest, any aspirations of any kind). Still, Bell apparently sees something in Ferro and invites him to his gym for a tryout. There Ferro meets up with a bunch of hungry (and significantly younger) prospects looking to impress Bell enough to get a shot to go to the Regional Olympic qualifier, the most promising being a light heavyweight named Robert Brown (Harold 'House' Moore). And against all odds (again), Ferro scores another knockdown during his tryout and gets an invite from Bell to go to the Regionals as his second light heavyweight representative, along with Brown. This immediately rubs Brown the wrong way and he pointlessly goes to work on breaking down the completely imperturbable (but now, at least, partially inspired) Ferro. Buoyed by his restarted boxing career, Ferro decides to ask out one his boxing class students, a perky and equally laid-back lawyer named Lindsay (played by Heather Juergensen, who I wish were in more things, as I find her funny and adorable). And so, like so many sports-themed movies before it, a romance blooms and plays out along side the boxing exploits, becoming effortlessly intertwined. The plot plays out pretty much as you'd expect, but it's kept afloat by the self-deprecating humor of Carolla and some pretty decent boxing action. It seems like Carolla knew that his voice and persona would be essentially kryptonite to any sentimentality, so he thankfully keeps the mushy stuff to a minimum and keeps the laughs coming. Given the material and the highly self-referential nature of the entire exercise, it seems like damning with faint praise when I say that Carolla can pull off playing himself. But I've certainly seen other people let their reach exceed their grasp in regards to role choices, so I can't fault the guy for keeping the training wheels on. As I said before, Carolla has a boxing background, so he's believable as a boxing instructor. The technical aspects of the training and the fight scenes are top notch, as are the settings (Bell's home gym is a familar California boxing stop). And Carolla is able to combine the boxing and humor effortlessly (the scene where he's skipping rope and humming along to the Mighty Mighty Bosstones is particularly hilarious). Unfortunately, where it starts to fall apart falls squarely into Carolla's lap too. Or, more to the point, onto his aged shoulders and pasty arms. Saying that credulity was strained while watching the Ferro character drop fighter after young, athletic fighter is an understatement. Maybe he should have given this script a shot back in his Man Show days. It wouldn't have seemed AS unbelievable. 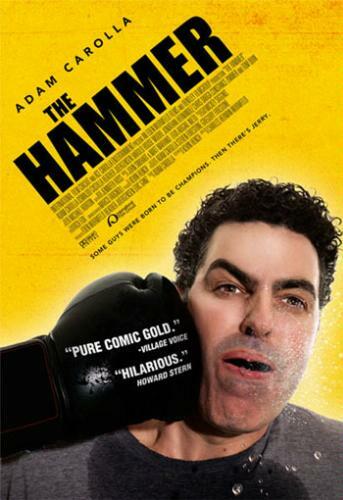 The Hammer treads some pretty well worn territory, so your enjoyment is most likely going to hinge on one thing: Do you find Adam Carolla funny? After some small sample size polling, he seems like a love 'em or hate 'em kind of personality. I do happen to find him funny. So, in keeping with the motif of this role's low-impact, barely taxing demand on Carolla's acting chops, I'm going to give this an equally tepid recommendation. I liked it, but don't knock yourself out trying to find this one. If it's on cable, giver a look-sie. As long as The Beastmaster or Clash of the Titans isn't on.